Cape Town - It seems like just the other day his son was following him into his home studio, eager to hang out with his famous dad and learn all about his work. Now his kid is a musician in his own right with a funky stage name and dreams of making it big in the music business – just like his pops, as he calls him. It’s clear the apple didn’t fall far from the tree with this one. Junior Khathi – aka Tank the Rockstar – has been compiling music material for the past year has performed live in Mzansi and Swaziland and has plenty of other gigs lined up. 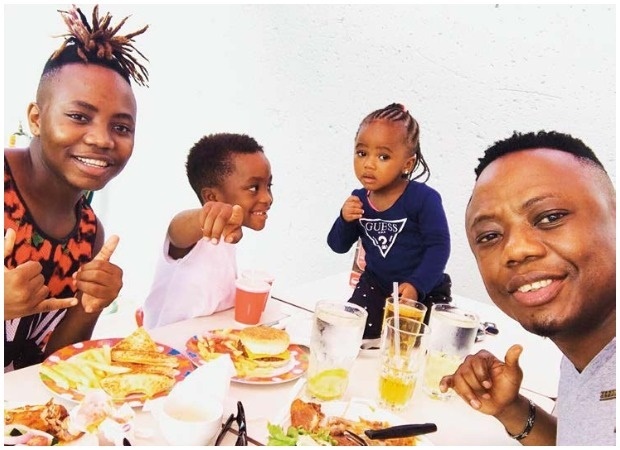 With all this going on you’d think his dad, Mthokozisi Khathi (41) – better known as award-winning music mogul DJ Tira – would be one proud papa. But he isn’t wild about his son’s choice of career. He’d prefer Junior, who’s a second-year sound engineering student, to get a “solid education” and some sound business knowledge behind him before trying his hand at the music game. Tira himself studied at the University of KwaZulu-Natal and has a degree in human resources and a postgraduate qualification in public relations. The dad of three – he has a younger son, Chase (7), and a three-year-old daughter, Chichi – knows all about how unforgiving the music business can be and wants to spare his kids heartache. “The rejection when you’re starting out is harsh,” he says. “As a father I don’t know how I’d cope if my kids had to go through that. Yet there’s no denying the musical genes flow strongly in Junior’s veins. He was 13 when he started wanting to spend more time with his Pops in Tira’s backyard recording studios. At that stage Junior was living with his paternal grandmother, Abigail Khathi, in KwaHlabisa in KZN and would come home for the school holidays. Tira will never forget the look on his son’s face when he entered the studio for the first time. “He was so happy and jumped up to reach the mic. I listened to him and I can tell you he has a better singing voice than me. “He’s also a good rapper. I know I don’t have those talents. I was happy to see him enjoy himself and I let him be,” he says, clearly proud of his boy despite his reservations about his career choice. Unlike his son, Tira developed an interest in performing and being a DJ relatively late in life. He recalls buying his first vinyl album while he was at varsity in 1995 and practising his DJ skills at varsity parties. Soon he was playing at weddings, private parties and nightclubs and he went on to become one of the hottest music men in Mzansi. Tank the Rockstar seems oblivious to his dad’s concerns as he speaks excitedly about the song Kuruza by DJ Bongz featuring Tank, Tira and Dbn Nyts. “The song came out last year and I feel it put me out there,” he says. Junior – who also has a new single, Flight Mode, coming soon to iTunes – refuses to let his dad’s wariness towards his budding music career dampen his spirit. In fact he feels he’s ready and disciplined enough to pay attention to both his studies and his music. What’s more, his mom Gugu is behind him 100%. “She loves my music,” he says. His other interests include modelling and he’s keen to start his own clothing label but says music is definitely his first love. Tira has studios in KZN and Gauteng and although Junior has access to them he dreams of owning his own studio. “I’d love to collaborate with my Pops again so I can raise money to build or buy my own studio – otherwise my Pops will have to sponsor me so I can build my own!” Junior has seen his father perform from a young age and he says his dad’s success doesn’t faze him – and he’s not worried about being overshadowed by him either. Something tells us Tira had better get used to the idea of his son being in the music business for a while.